Four Muslim teenagers, Farida Osman, Jihan Abdullahi, Amal Mohammed, and Zainab Hassan, were left stunned, and terrified Monday evening, when a patron at a Minnesota-based McDonald’s pulled out a gun, and aimed it directly at them over his own petty petulance. Watch all the videos from the incident here. One of the teens on the receiving end of this unhinged man’s weapon, Farida, told MuslimGirl that the confrontation commenced because the gunman lost his temper at being called out for his racist behavior. “Basically my friends and I were studying at the library down the street when we decided to go to McDonald’s because we were hungry,” recounted Farida, going on to state that her companions placed their order using Apple Pay. “They weren’t really familiar with it, so it took them a while to work it out, but they still couldn’t figure it out, so they gave up,” continued Farida. “Amin and his friends came over and that’s when…the man pulls out the gun,” concluded Farida. The rest of the incident plays out in its entirety on video. The patron is seen aiming the gun at the teens as they scatter, while he swiftly backs out of the restaurant in a cowardly attempt to escape from the consequences of his obvious overreaction. 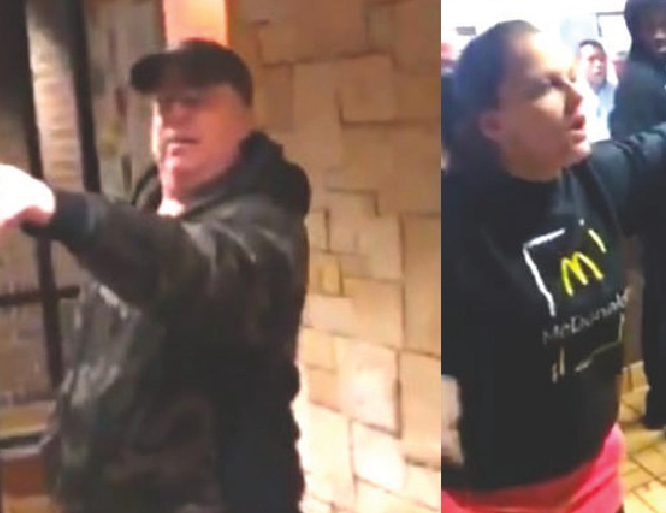 In the aftermath of this horrifying episode, the video depicts a McDonald’s employee screaming at the astonished teenagers, in an expletive-laced frenzy, insisting that they get out of her store. Equally incensed, another gentleman at the restaurant jumped to the aid of the teenagers in distress, vehemently protesting the idea that the victims of this heinous attack should be thrown out into the streets, along with the gun-toting lunatic. In an inexplicable judgement call, the staff at McDonald’s hesitated to call the police, only relenting under immense pressure from the teenagers, and their exclamations that they feared for their lives. Needless to say, this unhinged individual got away before the police arrived. It seems incomprehensible that the reaction to a heated exchange of words should be to aim a weapon at your adversary, and yet, this is the reality of America in 2018: that three, defenseless Black Muslim teenagers, would stand up against a racist stereotype, come face-to-face with a loaded gun as a result, only to then be threatened with expulsion from their only safe haven into the dark of night, where their cowardly attacker may be waiting for them, to finish what he began. This is America in 2018, and it is shameful.